There are two sports worlds. There is the world of mainstream sports, with its glamorous superstars, enormous budgets and massive marketing machines. Then there’s the world of passion sports, with its underdog heroes, relative poverty and niche marketing efforts. Everyone knows the mainstream sports legends. But in the passion sports, our heroes are legends in the true sense of the word. Stories of their accomplishments filter through the sport. Eventually, their names become renowned, if only among a few thousand enthusiasts. 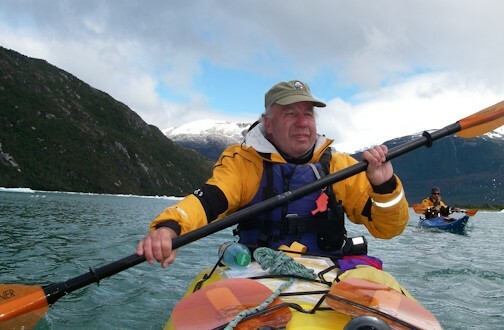 Kayak legend Reg Lake is one of those heroes. 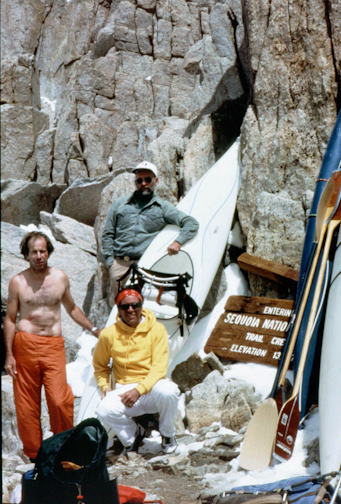 Thus began a long career in kayaking that drove Reg from day paddles to epic, boundary-smashing explorations. Once he got the feel for whitewater kayaking, he started to ask himself: is there anything more? This train of thought led him to some bold ideas. 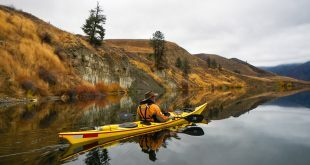 What if kayaks could be carried over a great distance to seek out some of these previously un-run rivers? How hard could it really be? And portage he did. Teaming up with famed climbers Royal Robbins (of Royal Robbins outdoor clothing), Doug Tompkins (co-founder of North Face and Espirit) and Yvon Chouinard (founder of Patagonia), Reg began a series of long hauls to run some truly wild waters. They would pack up their kayaks and all their camping gear and trek across the mountains to find elusive untouched whitewater rapids. So, the mountain people and the water people got together and had some epic adventures. They made their way across forest, rock and snow to some of the most remote rivers in the West. Along the way, they got pretty good at it. Reg Lake on the first descent of the Clark Fork of the Yellowstone River in Wyoming. One day, Royal was poring over a map and found something of interest to the team. No one had ever kayaked the headwaters of the Kern river, a mighty run that starts in the steep Sierras of Inyo county and peters out just east of Bakersfield. There was just one catch: getting there would mean a 22. 5 mile carry across Mount Whitney, the highest mountain in the contiguous United States. What sounds insane to you and me became a challenge to Reg and his team. The climb was arduous and the long, steep whitewater was a mental and physical challenge, but the trip ended in weary, wet success: the first running of the upper Kern. Reg and his team had done the impossible. I asked Reg how his success at these massive climbing/kayaking expeditions affected his understanding of what “difficult” really means. Reg Lake, Royal Robbins, and Doug Tompkins at the pass on Mount Whitney, elevation 13,777 feet before the first Descent of the Kern River. A remarkable 22.5 mile carry to the put-in at 8,000 ft.
And Reg kept moving. He continued finding new explorations in California and went on numerous coastal expeditions in Chile. 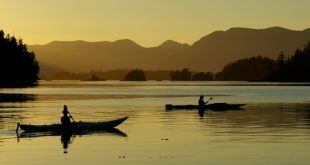 During this time, he was running his own kayak shop and learned the intricacies of kayak design. 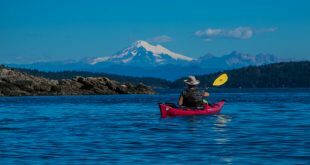 He was struck by the differences between sea kayaking and whitewater, and he explains why he prefers the whitewater. 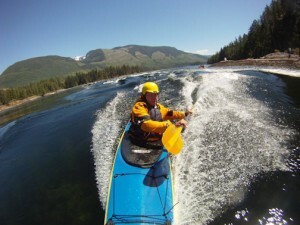 Nowadays, Reg Lake is busy with his friend Sterling Donalson at Sterling Kayaks in Bellingham, Washington. They build some of the most beautiful and technologically advanced kayaks in the world, with orders coming in from all over the globe. A recent fire destroyed the shop, but after some understandable grief and consternation, they are back at it and plan to be running at capacity by summer of 2013. If you want to get Reg Lake excited, talk about kayak design. Though hurtling inexorably into his silver years, Reg continues to paddle. The passion remains undiminished. 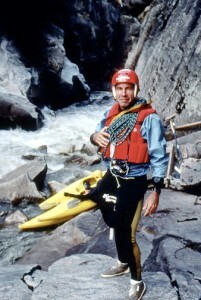 Among kayakers he remains a living legend. He’d bristle at this description, but in the world of passion sports we need our heroes. They don’t get TV deals or their faces plastered all over cereal boxes. Instead, they have their own secret club full of tremendous athletes; some of them fans, some of them champions. The only thing holding them together is their love of adventure, from the trails to the oceans. Reg has some sage words on the subject of “adventure”. This piece is a revelation to me. I know athletes making all the sacrifice of others who get paid millions, yet do it for the love of the sport. I lacked the words to describe these athletes. Thanks to reading Ted Rosen’s piece, I have learned the lingo of “passion sports.” I think its athletes are the true athletes. Great work.